A visit to a longhouse is often the highlight of a trip to Sarawak, offering a glimpse into the lifestyle of the various tribes who have for generations lived in the remote interior of Borneo. 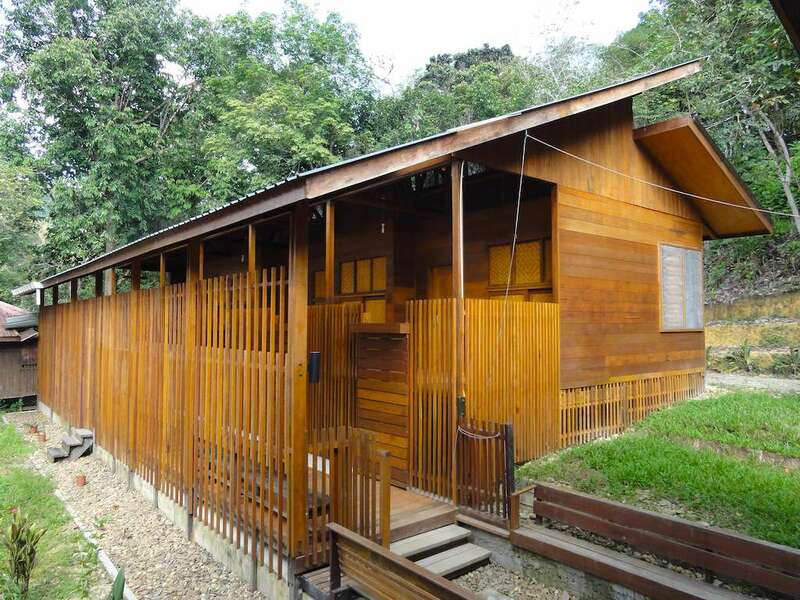 While there are many areas in Sarawak where longhouses can be visited, Ulu Ai is one of the best. What makes Ulu Ai so special is the natural environment and stunning scenery. 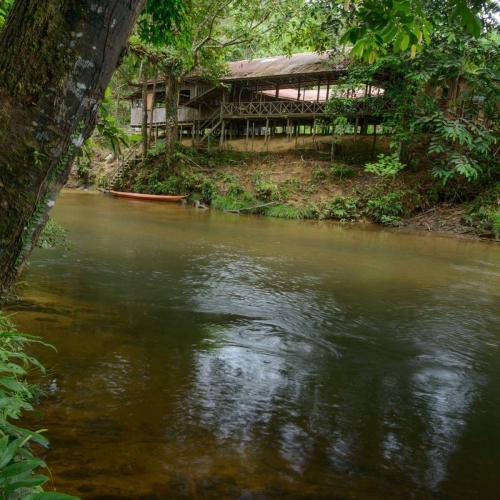 Clean rivers and jungle streams, refreshing waterfalls and undisturbed tracts of rainforest allow you to combine a range of outdoor activities with a longhouse visit. 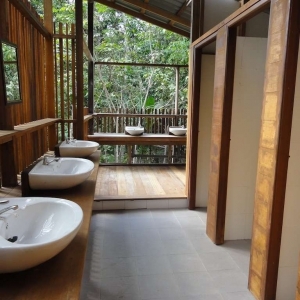 Borneo Adventure’s tours and activities at Ulu Ai are centred on our Nanga Sumpa Lodge. 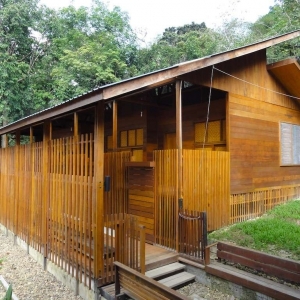 Located on the banks of the Delok River, approximately a 1½ hour longboat ride from the Batang Ai Lake. This award-winning operation was established in 1987 in partnership with the people of Nanga Sumpa longhouse. The lodge currently consists of an older main building containing the dining area, kitchen and staff rooms plus two new accommodation wings built in 2014. The three new Forest Rooms are approximately 35 m2 in size and include ensuite bathrooms. The rooms have mesh on the windows to keep insects out. The three rooms share an Iban-style ruai, or covered verandah. 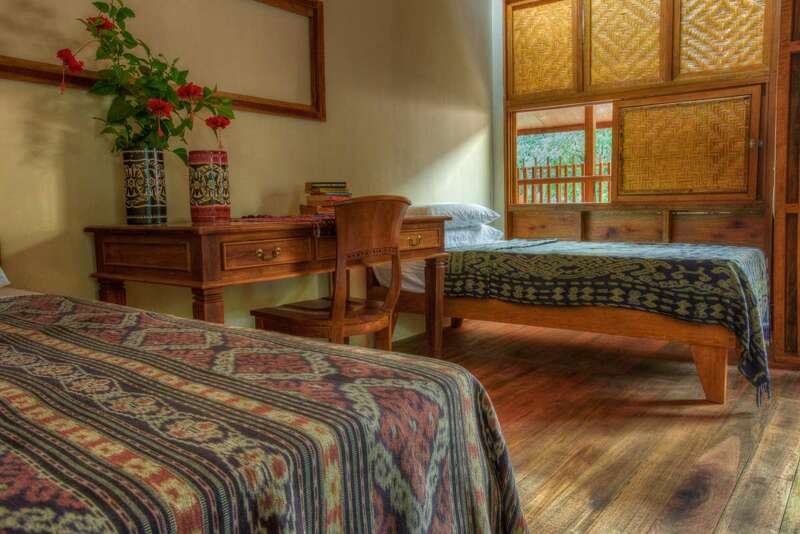 Each of the Forest Rooms can comfortably accommodate four people. These spacious rooms are ideal for families or couples seeking a higher level of comfort and privacy than was previously offered at Nanga Sumpa Lodge. 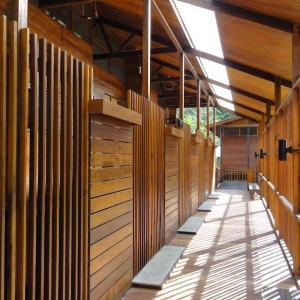 The new Ruai wing offers rooms with shared bathroom facilities. The building has five guest rooms, a multi-use space and its own shower and toilet block. 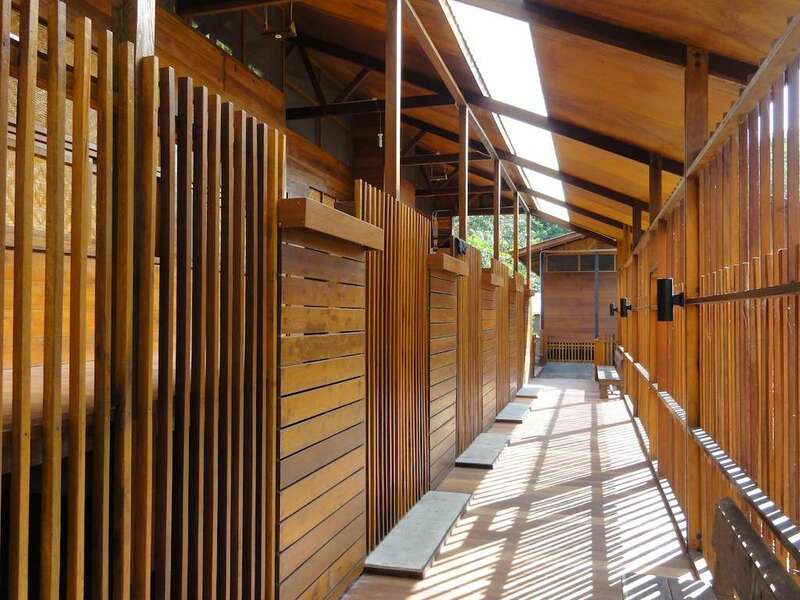 The Ruai is linked to the new Forest Rooms and the main lodge building by a wooden walkway. A generator supplies electricity from 6.30-10.30 pm to power the main lights and fans. Solar powered nightlights illuminate the public areas, walkways and bathrooms. Meals are prepared in the lodge and feature rice, noodles, chicken, fish, fresh jungle vegetables and other local delicacies. 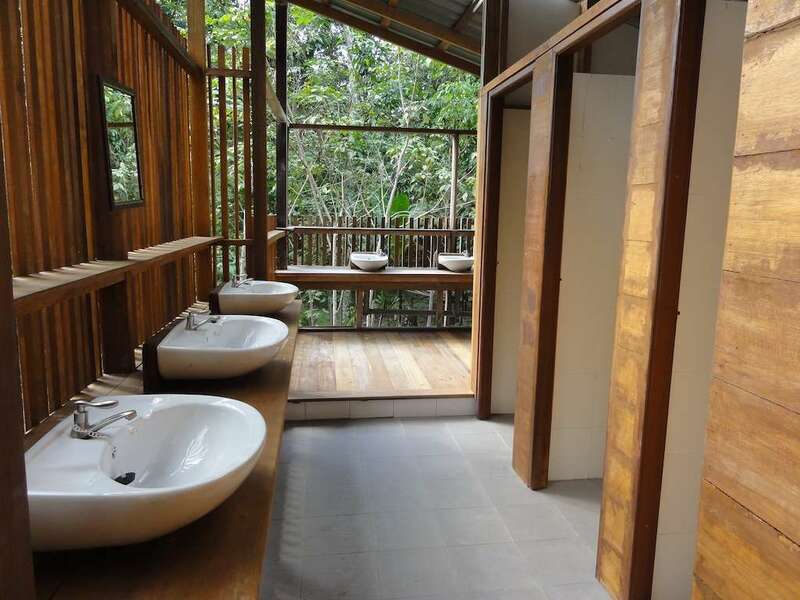 Nanga Sumpa is a jungle lodge located in a relatively remote area of Borneo. The facilities reflect the remote location and are somewhat basic. Many of our guests don’t mind this as the beauty of the area and the Iban people are the real attractions. However, we appreciate that the accommodation may not be as luxurious as some travellers require. 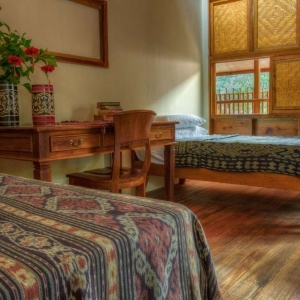 If you are looking for a bit more luxury the Aiman Batang Ai Resort & Retreat offers hotel standard facilities and air-conditioned rooms. Nanga Sumpa lodge serves as a base for a range of nature-based activities and excursions and offers visitors the chance of learning about the culture and lifestyle of the Iban community who live in the nearby longhouse. Activities at Nanga Sumpa include travelling further upriver by longboat to have a swim at a waterfall; visiting the longhouse and surrounding farms; participating in the daily activities of the Iban people; and jungle trekking on trails that take you along streams and through farmlands to primary rainforest. Orangutan live in the area and sometimes it is possible to see the “man of the forest” in its natural environment. For tailor-made programmes, tours and activities centred on Nanga Sumpa Lodge please contact [email protected].